Baking bread is so therapeutic for me; I just love everything about it. The way the dough feels, the way the house smells as it is baking and long after. There is nothing like it. I tried a new twist on a familiar recipe I have used for a long time, and our family says it is a keeper. 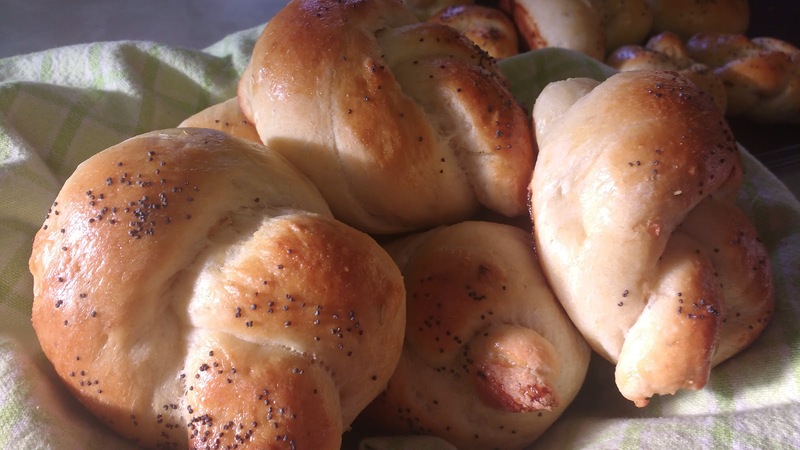 Sometimes I like to make flavored rolls to change things up a bit from the usual to serve alongside a simple supper of soup or stew. This recipe makes two dozen but can easily be halved if you only want to make a dozen. Allow the yeast to proof for 10 minutes. If you are using instant quick rise yeast just add the dry yeast in with the flour and add the water and honey with the milk and oil. Combine 4 cups of the flour with the potato flakes, salt, onion, rosemary. Add the yeast mixture with the milk and oil. Knead together for 8 minutes adding more flour as needed to make a soft dough. Let rise until double in bulk. About 40 minutes if using instant yeast and 90 minutes if using traditional yeast. Roll each ball into an 8" rope and tie into a knot. Brush with the beaten egg and desired poppy or sesame seed. Let rise again until double. 20 minutes for quick rise, 45 for traditional yeast. Bake at 375 for 15-20 minutes or until golden brown. My oven was 15 minutes. I don't use processed foods. Can I use a baked potato, mashed in place of the instant potato? Oh wow those look so good! Looks like a great recipe Charlotte! I share your feelings about making bread. It is such a spiritual process, probably in part because my mother baked our bread (and still bakes at 95 years old) and my grandmother and all the women before them. I will be trying your recipe very soon. Thank you!